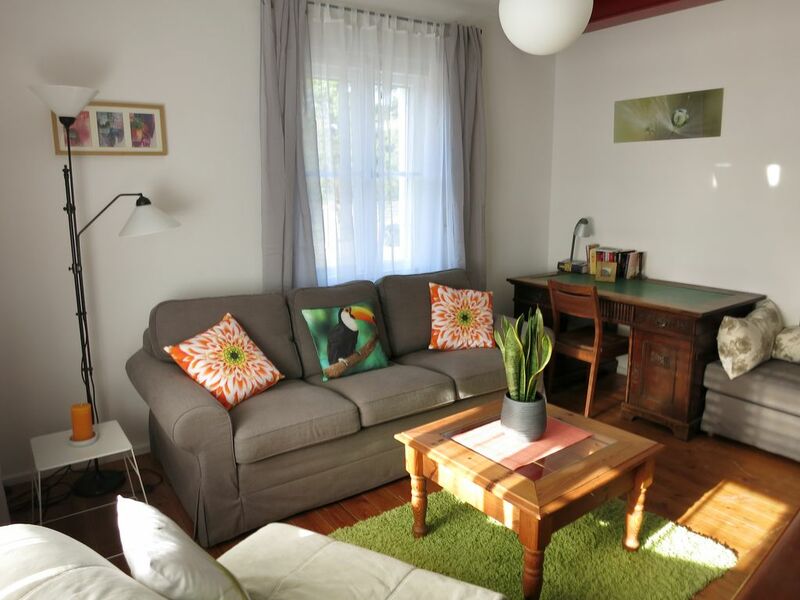 You are looking for a cosy apartment (55m²) for 1-5 persons? We offer you a bright and friendly flat with modern equipment and exclusive details, totally renovated on an eco-basis in 2009. The flat is situated in the ground floor. There is a kitchen with kitchenette, dinning area for 5 persons and a pantry, a livingroom with a piano, a big writing desk and a comfortable couch with sleeping for 2 persons. The large bedroom is equipped with a twin bed, a single bed and a large a walk-in cupboard. The new comfortable bathroom has a big bath tub, shower, toilet and washing bassin. The apartment is completely equipped with all necessary like dish washer, towels, dishes, Hi-FI, flat screen TV for a pleasant stay. Ich hatte meine Freundin zu einem romantischen Wochenende nach Nürnberg eingeladen, das ich noch vom Studium her kenne. Die helle Wohnung hat uns mit einer Mischung aus antiken und modernen Möbeln auf Anhieb gut gefallen. Es war sauber und sehr gemütlich. Die Küche ist groß und gut ausgestattet, ideal auch für Selbstversorger. Das Haus liegt ruhig und ganz in der Nähe des Wöhrder Sees. Wir sind am See entlang in ca. 20 Minuten in die Innenstadt spaziert. Abends haben wir die Straßenbahn genommen. Leider war der Aufenthalt viel zu kurz. Nürnberg hat auch kulturell viel zu bieten, meine Freundin war begeistert und wir werden bestimmt bald wieder kommen. vielen Dank für Ihre schönen Zeilen! Ihnen und Ihrer Partnerin alles Gute. Wir freuen uns, wenn Sie uns wieder besuchen!! I stayed in apartment 2 for 4 nights in August 2011 with my husband, 4 month old baby and my parents. It is a lovely, clean and modern apartment in a 3 storey house in a quiet, safe-feeling neighbourhood just a short tram journey from the centre of Nurnberg. The proprietor, Udo Schlund, gave us excellent service throughout and provided us with lots of useful info on travelling to the apartment (easy: the tram stops at the end of the road and you walk 5 mins in a straight line!). We travelled to Nurnberg and Munich in the middle of a rather warm summer (33 degrees C) and although the flat is not air conditioned, we kept comfortable by keeping the sun out with the window shutters which are typical of the style of housing in Germany. The bathroom was a good size and there was plenty of hot water (although we were mostly taking cool showers!). The flat is indeed cosy, two people sleep in the main bedroom and the others sleep on the sofa bed in the lounge. The pull out mattress is small but suitable for someone like me (5 foot 4 inches). Udo kindly provided a baby travel cot which was in immaculate condition and gave me somewhere to put my son down to play. The flat is at the gateway to a lovely public swimming pool and leisure park, www.bayern07.de, which has a adult leisure swimming pool, an adult pool with lanes for serious swimmers and a paddling pool for small children. It's fantastic, I wish we had something like that in the UK where we live, but we never have the good weather! You can take a scenic walk to the historic centre of Nurnberg through this park or you can follow the main road to get to town in about 15 mins. There is a large Lidl supermarket and a petrol station about 5 mins walk from the flat. There is a bar with a restaurant serving simple but tasty food, in the park next to the flat, this seems to stay open quite late, even when the pools are closed. I am so glad we visited Nurnberg and we would definitely return to this flat if we find ourselves in Nurnberg in the future. Nurnberg is a beautiful, unspoiled, civilised city with plenty to keep all ages amused for 3 or 4 days. Dit begane grond appartement ligt tegen het zwembad, nabij het strand en tegen het park. Ideaal, echter was voor ons gezin toch echt te klein.